Many suppliers go down the cheap route and provide cheap or even plastic jars which can cost as little as €2 from hardware stores. 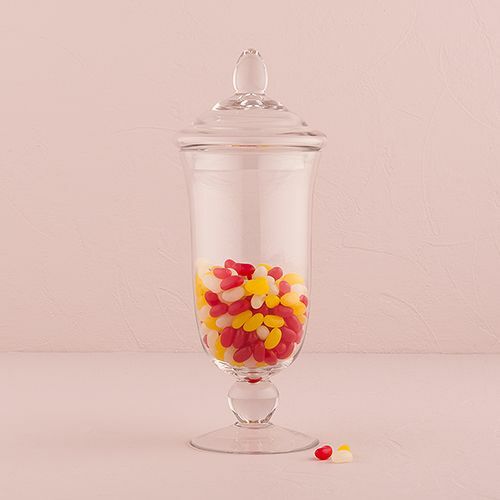 However, at Candy Cart Hire, we only use the most elegant and stunning apothecary glassware. The choice of glassware can really help a display to stand out. It’s important to choose a wide range of different jars to bring out the colour and texture from your candy buffet. Once used by pharmacists in your local pharmacy, apothecary jars now used for decorative purposes in the home and at special events. Beautiful and detailed, apothecary glassware served two primary purposes: storage and display. They were used for material storage but their elegant designs helped them to stand out in pharmacies. Apothecary jars were usually manufactured in the form of round or square bottles and were often transparent and colourless. When you book a candy cart with us, we only use the most elegant glassware such as straight sided, globe and bell shaped apothecary jars. So place a booking with us and add a dash of sophistication to your event.